Our Convention seeks to build solidarity and mobilize participants to preserve and protect our shared values and vision for more just and inclusive communities. National CAPACD is pleased to invite you to the "2017 Building CAPACD Convention" on September 11–13, 2017, in Washington, D.C. This year, we celebrate 17 years of building a social justice movement together! 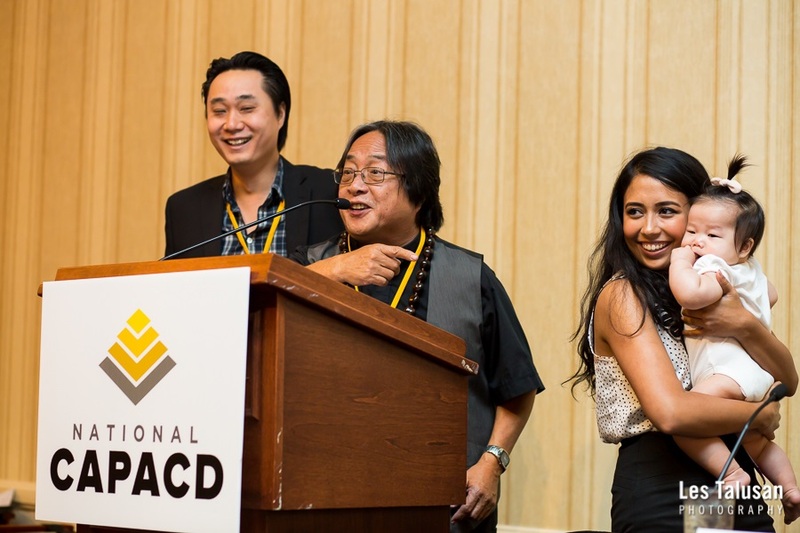 Each year, hundreds of Asian American and Pacific Islander (AAPI) organizations and our allies from across the country convene for our annual Building CAPACD Convention, one of the largest gatherings of community development practitioners, community organizers, policymakers, and private sector partners. Join us as we continue to build a future in which AAPI communities and all communities of color have the economic resources and opportunities they need to thrive. Please be sure to register before attending any of the sessions. It’s not too late to register! Register here. If you would like to share information about your organization, please feel free to bring brochures to place on the resource table. Asian American, Native Hawaiian, and Pacific Islander communities around the country are facing a new political and social reality. As targets of hate and institutional surveillance, our communities are experiencing heightened levels of fear that often impact their ability to be socially and civically engaged, but also politicize and move them to re-imagine the possibilities of engagement. We will open our Building CAPACD convention with stories from our member organizations about the innovative and inspiring strategies they are employing to address the new (and not so new) issues that are emerging in neighborhoods across the country. Given the state of our communities, what is our call to action today? 2017 marked the 135th anniversary since the passage of the Chinese Exclusion Act, the 75th anniversary of Japanese-American internment, the 25th anniversary of the L.A. riots and today, the 16th anniversary of the attacks of 9/11. These events are a reminder of our shared history of imperialism, immigration, migration, and xenophobia—they are also a reminder of our resilience, built through decades of community advocacy and organizing. In this interactive session, we will examine significant historical events and share stories of community empowerment to build and sustain a strong collective AAPI voice. We will engage together to ask, “How do we draw hope and strength from our histories to confront the current obstacles that our communities face?” Join us as we remember and learn from critical moments that have shaped AAPI presence in the United States. The success of political movement-building efforts depends not only on our ability to engage individuals and organizations in our own network, but also adapt and respond to changing circumstances when there are immediate political threats. This past year, we have seen historic attacks on civil rights and different communities of color. This plenary will feature nonprofit leaders who will share stories about coming together, expanding their missions, and moving towards a united community in an uncertain political climate. By bringing diverse groups together, we can start to recognize the importance and strengths of each of our communities in the larger narrative, as well as the need for a common, deeply rooted, and broad- based movement towards justice. Enjoy an evening dedicated to honoring art and its power to inspire hope and build solidarity across communities and generations. Attendees are encouraged to exchange innovative ideas and strategies for supporting art in their work to build healthy and thriving neighborhoods for AAPI communities. As practitioners and social justice advocates working with underserved populations, we often struggle with making the case for our community’s needs to our policy makers and institutions. Data and mapping are effective tools to further community based strategies for local advocacy campaigns, fundraising, and planning efforts. Join us for a conversation with experts in the field of data, mapping, and community based planning to learn effective tools to further your work. Looking for a little inspiration these days? Join this session to hear from National CAPACD members who have empowered and supported youth in their communities to be the change agents we need today, tomorrow and for generations to come. This conversation will focus on shining examples of youth-led movements, and what it means to be an adult ally in this work. As community based organizations our work is often framed around issues which impact our communities: housing, health care, or economic empowerment. But as black lesbian poet and activist Audre Lorde said, “There is no single issue struggle, because we do not lead single issue lives.” Join us for a conversation on how women and lesbian, gay, bisexual, and transgender AAPIs are impacted by racial, economic, and gender justice. The political landscape today seems more divided and polarizing than ever before. But one glimmer of hope is that everyday Americans seem eager to act to protect principles of fairness, equity and social justice in unprecedented ways, as evidenced by the Women’s March to protests at airports to resist the Muslim ban. This session explores how local coalition building across multi-ethnic and multi-racial lines can create unlikely yet powerful alliances to combat threats against our communities. Panelists will discuss the importance of coalition building in today’s political climate, share examples of successful allyship within their own communities, and offer first-hand experiences on how the progressive AAPI movement can be an ally for other communities organizing for social change. This workshop will explore how creative collaboration between artists and activists has had tremendous success in inspiring and igniting communities into action. Presentation and discussion will cover various art forms as methods for building communities and promoting change. Participants will hear from a diverse panel of artists engaging in innovative work and will learn best practices for facilitating creative partnerships between community practitioners and artists. Equipped with an understanding of art as advocacy, participants will leave with tools to put to practice what they learned to inspire action in their respective communities. Asian American and Pacific Islander (AAPI) communities are presented with a unique set of leadership development challenges and opportunities - especially within the current political climate. It is now more important than ever to develop a robust pipeline of progressive leaders who can continue to advocate, organize and inspire our movement for greater social equity. 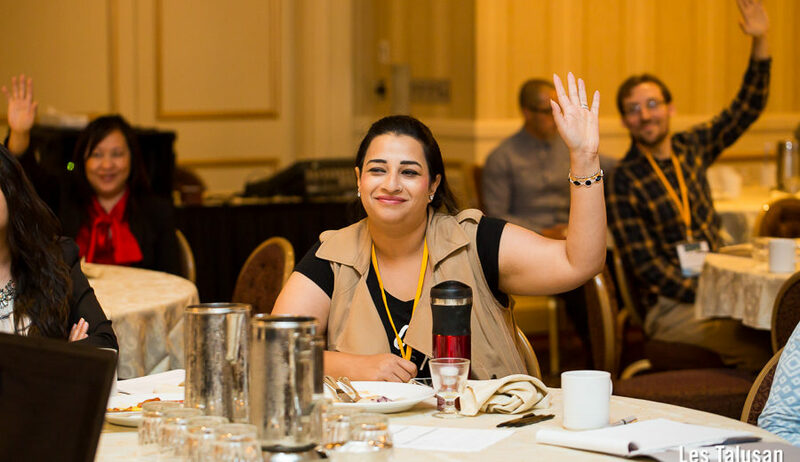 Join National CAPACD members and experts in the field to explore innovative and culturally appropriate strategies for cultivating leaders who can meet their full potential as champions for change. As a coalition of Asian American and Pacific Islander organizations, we recognize that the strength of our neighborhoods and our country is its diverse people. The current climate of hate violence, religious discrimination, and anti-immigrant sentiment are counter to the communities we strive to create. This administration’s anti-Muslim, anti-immigrant policies have dragged our country backwards, and encouraged and emboldened hate against South Asian, Muslim, Sikh, and Arab American communities. We envision inclusive thriving neighborhoods, where all people can live safely in their homes and communities, regardless of their religion, race, or ethnicity. 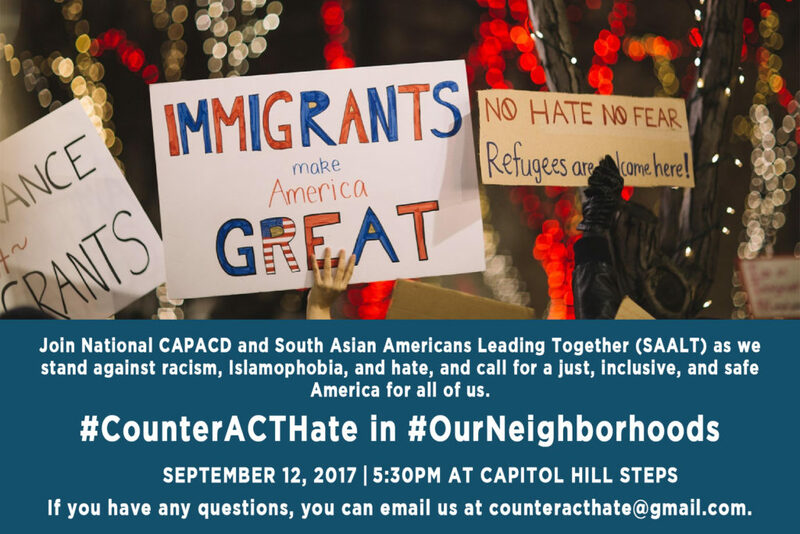 Join National CAPACD and South Asian Americans Leading Together (SAALT) as we stand together against racism, Islamophobia, and hate, and call for a safe America for all of us. 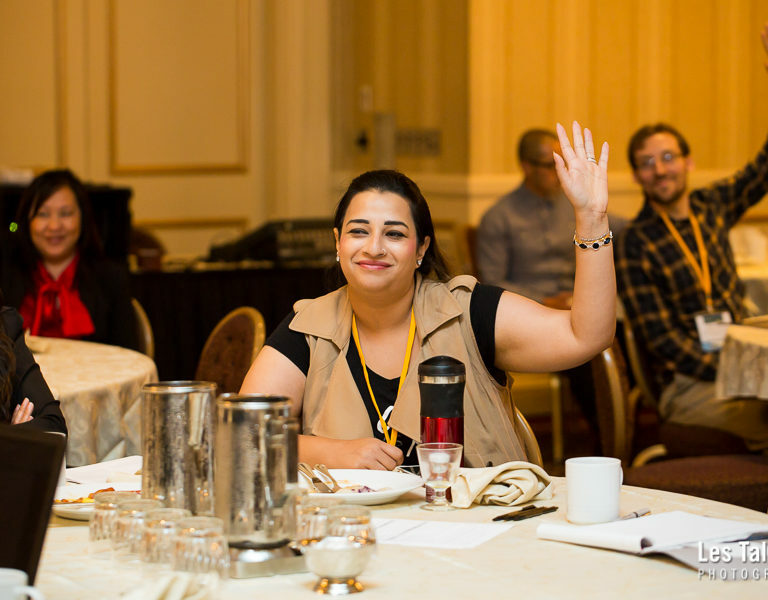 After two days of hearing innovative programmatic, policy, organizing and advocacy strategies from across the country, now is your chance to share your own work with other convention attendees! These strategy sessions will focus on local policy strategies to address anti-displacement and gentrification in #OurNeighborhoods. This session will be led by our Community in the Capital Fellows, leaders from across the country and the Pacific Islands, who have trained with National CAPACD to develop their federal policy and advocacy skills over the course of the past year. What is next for our movement? Our goal is that Convention Closing is not the end, but the beginning. Members will report back from caucus meetings about their planned next steps. And, more broadly, we will open the floor, townhall style, for all of us to talk about What Next for our shared movement. How do we continue forward the relationships started, the enthusiasm built, the alliances strengthened? How do we continue the momentum? What are our commitments to each other? How will we build communities of resistance AND communities that are healthy, thriving, and supportive? RSVP for the rally and sign on your organization as an endorser! Once you arrive, please have your ID to check in. If you have any issues with checking in or issues with your room, email events@nationalcapacd.org. Experience refreshing lodging near Washington DC attractions at Kellogg Conference Hotel. The 99-acre campus includes the original Gallaudet campus, listed on the National Register of Historic Places. It is located approximately 1.5 miles from Capitol Hill and 2 miles from the National Mall. By train: At Union Station, take the escalator up to the Amtrak/Commuter Level (Mezzanine Level), head north through the sliding glass doors, and take the escalator/stairs to the bus deck level. Use pedestrian walkways and follow signage to access the Gallaudet Shuttle bus. The hotel will be the last stop on the university shuttle. By car: There is complimentary parking on-site. For location information, please click here. For directions to the hotel, please click here. 2017 Membership Dues must be paid to receive member rate. For the first time, we are excited to offer childcare for all three days of the event with a suggested donation of $100 total per child. If you are interested, please email events@nationalcapacd.org with their name(s) and age(s). We will confirm whether or not we have a spot reserved for you. There are a few spots still available!